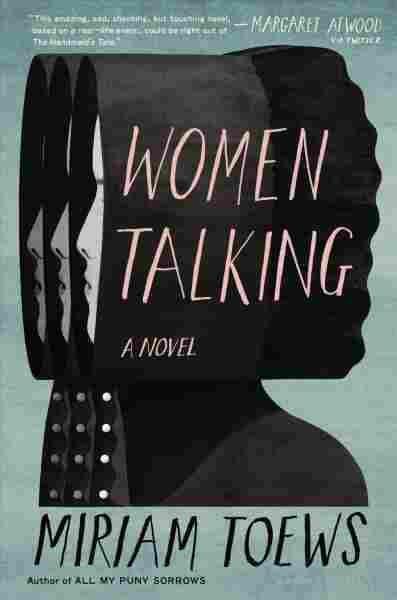 Book Review: 'Women Talking,' By Miriam Toews Miriam Toews' new novel follows a group of women in an isolated religious colony as they struggle to reconcile their faith with a series of horrific sexual assaults committed by the colony's men. The Canadian writer Miriam Toews opens her astonishing eighth novel, Women Talking, with a matter-of-fact Author's Note. Between 2005 and 2009, she explains, eight men in a remote Mennonite colony in Bolivia raped many of the girls and women in their community, first rendering them unconscious with cow anesthetic. Women Talking is "both a reaction through fiction to these true-life events, and an act of female imagination." It is also a work of deep moral intelligence, a master class in ethics beautifully dressed as a novel. And, surprisingly given the title, Women Talking is narrated by a man. Toews opens her novel after the rapes have been discovered. Peters, the colony's monstrous bishop, has had the rapists arrested to protect them from the women's rage, then issued an ultimatum: "When the perpetrators return, the women of Molotschna will be given the opportunity to forgive these men, thus guaranteeing everybody's place in heaven ... [Otherwise] the women will have to leave the colony for the outside world." The women delegate this unbearable choice to two families, the Friesens and the Loewens. Each family brings a mother, two adult daughters, and a teenage daughter or niece to the negotiations, which take place in a dementia-addled farmer's barn. Ona Friesen, who belongs to the middle generation, in turn invites the town outcast, August Epp, to serve as scribe. She wants the meeting recorded for posterity, and in Molotschna, only men can learn to read and write. 'Women Talking' reverses the patriarchal structure under which these women live ... Now, women's ideas are the center, and they get to make a man write them down. I will admit to some skepticism when August introduced himself, formally and modestly ("My name is August Epp — irrelevant for all purposes, other than that I've been appointed the minute-taker for the women's meetings") on the novel's first page. Despite the beauty of Toews' prose and the constant, delicate humor of August's self-effacing perspective, I resisted him, and by extension the novel, for as long as I could. Why, I kept thinking, is a man telling this story? Why can't the women tell it themselves? But soon I understood: Women Talking reverses the patriarchal structure under which these women live. Until this moment, intellectual discourse in Molotschna has been reserved for men. Now, women's ideas are the center, and they get to make a man write them down. August, it turns out, earns his keep. As a narrator, he occupies a space similar to Nick Carraway in The Great Gatsby or Nelly Dean in Wuthering Heights. As a character, he has the sweet, hopeless sincerity of Motherless Brooklyn's Lionel Essrog. That sweetness becomes crucial, since it gives the novel a pressure valve. When the women's rage and grief grows unbearable, August guides readers gently away. Those breaks are important, because though Toews' writing is simple and often funny, her ideas are difficult in the extreme. Women Talking works like a Socratic dialogue, the Republic moved to a Mennonite barn. The Friesen and Loewen women become architects of their own theology. They have no other choice; in order to come to a decision, they must reconcile Mennonite belief with the reality of Molotschna, a town in which they can never be truly safe. On the one hand, they want to go to heaven; on the other, how can they forgive the men who raped them, their daughters, their friends? Agata Friesen, one of the matriarchs, is the first to figure it out. If the women stay, she says, they would "knowingly be placing ourselves in a direct collision course with violence, perpetrated by us or against us ... By staying in Molotschna we would be bad Mennonites. We would be sinners, according to our faith, and we would be denied entry to heaven." This is the core of Women Talking. As the novel progresses, the women discard "the male interpretation of the Bible and how that [has been] 'handed down.'" They replace it with a female interpretation, which they hand down to August Epp. Here, too, August proves his importance. Because he is there to take minutes, the women are able to speak not only to each other, but to the future. 'Women Talking' is a profoundly intelligent book. It is an indictment of authority and a defense of belief. As the novel progresses, the women become increasingly conscious of that future. They begin arguing fiercely over word choice, striving not only for clarity, but for precision. Toews' emphasis on names and definitions serves to highlight how precise her own writing is, and how smart. The intelligence on display in Women Talking is as ferocious as it is warm. Women Talking is a profoundly intelligent book. It is an indictment of authority and a defense of belief. Listening to the women pray, August thinks, "I remember how my father ... told me that the twin pillars that guard the entrance to the shrine of religion are storytelling and cruelty." Toews leaves the first pillar where it is, but there is no cruelty here. In the half-abandoned barn that becomes these women's shrine, storytelling is a collective act, and religion survives only through generosity. If only more of the world worked the same way.